Google Chrome gets a major overhaul. More Speed, More Secure and More Smart. The Beta Version is now available for download. You can test its speed by downloading from the link provided at the bottom of this post. Chrome is my favorite browser. Although i have installed Firefox, Opera, Maxthon and a load of other browsers too on my computer, i use Chrome the most frequently. Simply because its fast and i like things to get done quickly. The new Chrome is all about adding more speed. To get you where you want to go even faster, Chrome will now start loading some web pages in the background, even before you’ve finished typing the URL in the omnibox. If the URL auto-completes to a site you’re very likely to visit, Chrome will begin to prerender the page. This is a great feat, isn’t it guys? I bet there is no other browser which pre-renders a webpage, atleast till now! Apart from the speed improvements, the Google Chrome Team is also focused to provide the browser with extra security features when downloading a file. Kinda like, the Safari, but this is more Google. When you download executable files such as .exe and .msi, which are considered as threats to your Computer, the new Chrome will automatically notify you that its dangerous and ask you if you want to still consider downloading it. I guess this was a major security feature which completely lacked in the previous versions. I hope the Google Chrome browser will continue to be the best browser in the world. Download the new Google Chrome Beta over here. If you liked this article, please don’t forget to pass on your comments! Which is your favorite browser by the way? Facebook for Chrome extension is a handy little extension to enhance your Facebook experience and get rid of all the unnecessary distractions. It integrates into the Google Chrome browser and brings to you only the latest, most important updates to your notice. Of course, it is not the official extension. This google chrome extension is developed by a guy named Zachary Allia. After installation you can see this extension icon sitting on the top right of your browser. Clicking it will not open a new tab, it will open a popup within the same window and display your Facebook News Feed. No need to go to Facebook.com to update your status, just do it by clicking the extension icon and typing your status message. One thing i really like about this extension is its Instant Notifier. It immediately sends you notifications by showing a number on the icon, its not at all disturbing and intruding. After clicking a notification, it will immediately show you that particular post to minimize unwanted interactions. You can comment and like a post right from the popup quickly, without opening it up on Facebook.com. Presently tagging your friends in posts is not supported but that feature will soon be added in the next update. Jump to your Events tab, Photos tab, Messages tab quickly right from the popup. Goto the original Facebook site easily by clicking the Full Site button shown in the popup. Download Facebook for Chrome extension now and enjoy Facebooking smartly like a professional without having to waste your time by looking at all the unimportant updates in your life. To top it all off, its totally free on the Chrome Web Store. Comment and let us know if this extension has helped you reduce the man hours you have spent on Facebook. Are you one among the few who hate the new twitter or are you just lazy to go to the twitter website? Then these extensions can Give you a great helping hand! To be summarized, Chromed Bird is simply A better alternative to the twitter web. It is more or less having the functions of Twitter web but in the shape of an extension. No more rule that you must see the tweetmeme button only in blogs, Now they can invade your address bar too! Go grab the extension and make the use of a very well-known twitter client. What I love about tweetmeme is I can tweet my heart out as well as make use of the URL shortener retwt.me. Related: Where not to use an URL shortener? Want to share a link? Hit the Hootlet button, and automatically, the URL is shortened and text is grabbed from the site. You can also schedule your messages to get sent at a later date, or as a draft. This something which most of you didn’t know. The updated version of goo.gl URL shortener’s extension allows you to tweet. But before you can tweet you must go to the options and enable it. Most of us would have forgotten this method of tweeting just because of the advent of add-ons and extensions. At least I did, in the beginning. What’s special about the official twitter Bookmarklet is that it is the only way so far to use t.co links in your posts other than the tweet button. Are you a firefox user and looking upon a similar round up? To never miss out a single update, stay tuned to our RSS Feed! To receive more updates about twitter, follow @chaaps on twitter. Compete, Dmoz, Majestic SEO, SEM Rush and Quanticast. Image tags with alt info. Liked SEO Site tools? Then why wait? Go get SEO Site tools! Ever wondered how fast is your browser ?? 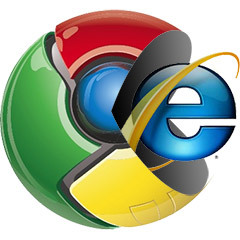 Do you want know which browser among all is the fastest browser out there. Do you want to have the best browser ? Google knows all this and they are working their behinds off to make the best browser in the market.Check out this video which show how google test the browser . Now that you are clear how good chrome is. Here is where you can download Google Chrome. Google chrome, my favorite browser because it is fast, stylish and also simple. It has colorful artistic themes and ultimately powerful extensions. Most of the chrome extensions are already present as firefox addons, but anyway chrome lovers will always love chrome extensions. Few days back, Google UK has released an awesome video on YouTube to promote Chrome extensions. This commercial describes features of Google Chrome extensions. Once the webGl standard become available and public. Online Gaming will have a overhauled look :). No more tricks anymore. Google is now really going to integrate 3D into its web browser. This is one of the first technologies to integrate 3D into a web browser. The first initiative was taken by CSS 3 project. Google has launched a new project for Chrome that will let the browser run a wider range of 3D graphics content without downloading additional drivers. The project will be an open source project aiming to give a better interface to users. This project code named the ANGLE (Almost Native Graphics Layer Engine), seeks to let Chromium run WebGL content on Windows computers. WebGL is a developing cross platform aiming to set web standards for accessing low level 3D graphics hardware based on the OpenGL ES 2.0 API (application programming interface) that can be implemented directly in a browser without a plugin. WebGL has already been implemented in several browsers. The only difference in this project is that, this is independent of WebGL drivers. All other browsers which are currently using WebGL have to build plugins for integrating this new technology. OpenGL is an API for 2D and 3D graphics rendering, available on Windows, Linux and Mac OS X operating systems. The best competition to this technology is none other than Microsoft’s own graphic rendering engine DIRECT 3D, which is part of the company’s DirectX graphics technologies. Microsoft being popular and the most successfully running company today, has managed to get into the gaming industry through its excellent graphics support in Direct X. Most well known PC games today are dependent on Direct X graphics. But a post on Wolfire tells us why we should use OpenGL and not Direct X. Wolfire is a gaming company which still uses OpenGL for its games instead of Direct X. The main problem with the wolfire concept is that Windows OS cannot render WebGL content because the OpenGL drivers are not installed, even though the computer has powerful graphics hardware. Computers running OS X or Linux are fine, however, since those operating systems use OpenGL as the primary 3D API. This problem will cease with the release of the ANGLE project. This project will allow you to use the WebGL content without having to find or install any new drivers. Since ANGLE aims to use most of the OpenGL ES 2.0 API, it may help developers working on mobile and embedded devices. This is quite a good news for developers as they can make apps which can work on both Windows, OS X and Linux based systems. This should set a new standard in the graphics market. ANGLE should make it simpler to prototype these applications on Windows and also gives developers new options for deploying production versions of their code to the desktop. This new project is determined to change the way we look at graphics. Don’t be surprised if tomorrow you get games which do not require Microsoft’s Direct X, but give you even better quality. This is the new aim of every developer. Surely no one likes installing a bunch of apps just to run another app. Every app should be independent and the ANGLE project is built on this concept.